Bordered by the English Channel on the southern side and Surrey, East Sussex and Hampshire on the others, West Sussex is a county in Southern England that has kept the vibrant English countryside spirit alive and well. The county is characterised by a rich biodiversity and one can encounter coastlands, hills, forests as well as undulating dales along it. Thus, the beautiful country landscape makes West Sussex the best backdrop for cycling, hiking or biking through the countryside. West Sussex is characterised by geographical diversity to a large extent. Towards its eastern side, one can find the Weald-Artois anticline which has been eroded greatly by the elements of time leaving rocky areas exposed without the cover of chalklands. These rock surfaces rise high along the Lower Greensland Ridges near the border of Surrey. The county’s highest peak, Blackdown is located in this area. The intermittent valleys amidst the highlands are drained by rivers Arun, Adur and Lavant. West Sussex experiences a pleasant climate which varies throughout the county due to the variation of geographic elements. The coastal areas experience a large amount of Sunshine as well as rainfall. In fact, West Sussex is often described as the sunniest county in England. The cool sea breeze moderates the weather in the coastal areas. Winter rains are important for this shire because that is how the local chalk aquifers get recharged in order to act as a source of water supply later. The county also boasts of a well-developed infrastructure that has helped in establishing a strong economy in the region. 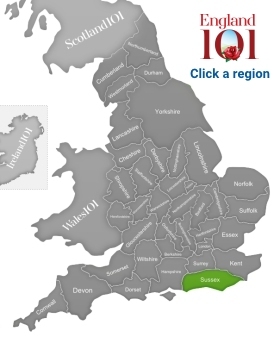 West Sussex is well-connected through a network of roadways and railways that facilitate material movement and thereby helps in promoting trade and commerce activities. The local govrnment has been trying to promote commercial activities in the region, though growth has been slow in the last few years. Most of the employment is provided by agriculture, healthcare, logistics and manufacturing sectors. West Sussex county boasts of a rich rural heritage that defines it to a great extent. One can visit the Weald and Downland Open Air Museum to get a taste of the rural lifestyle that has pervaded the region from the 14th to the 20th centuries. The Amberley Museum & Heritage Centre provides insight into local crafts. 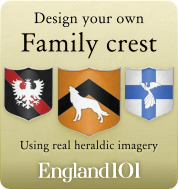 One can explore the cultural heritage of the county even in the Arundel Castle which had once housed the Dukes of Norfolk, the charming Wakehurst Palace, the Petworth House with its treasure trove of art collections and the Bignor Roman Villa. With geographical diversity, cultural legacy and plenty of sunshine, West Sussex exhibits the warmth of hospitality and the charm that only English countrysides can boast of. 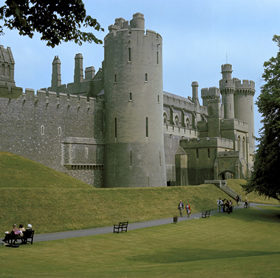 Arundel castle, Arundel, West Sussex. 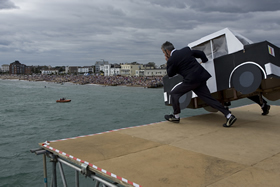 Competitors in the annual International Bognor Birdman competition launching themselves from the pier. 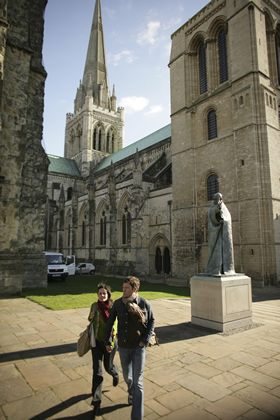 Couple walking through the grounds of Chichester Cathedral on a bright autumn day, Chichester, West Sussex. 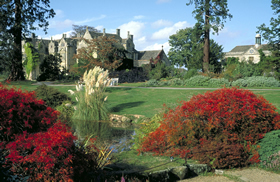 Gardens in the autumn, Wakehurst Place, West Sussex. 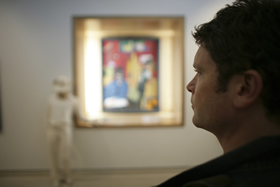 Man inside Pallant House Gallery, browsing an impressive collection of British art from the 20th century, in the heart of historic Chichester.